Quicken Loans Arena turned into Wonderland for a very special group of kids on Wednesday night. 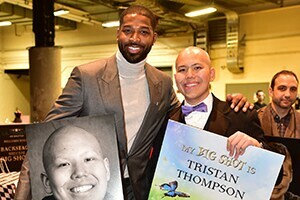 More than 40 pediatric cancer survivors and fighters were the true stars of the night when the Cleveland Cavaliers hosted the annual “Big Shots and Little Stars” fundraiser, benefiting Flashes of Hope and The Children’s Tumor Foundation. In addition to their teammates, Cavs players were joined by The Mad Hatter and Queen of Hearts, among other Alice in Wonderland characters, for this unique and entertaining evening. Big Shots and Little Stars helps raise awareness and funds for pediatric cancer research. More than 1,000 of Northeast Ohio’s business and community leaders gathered at The Q for the event of the year on Wednesday, first enjoying a reception full of food and drinks, followed by an engaging stage show. Cavs head coach Tyronn Lue and his staff, along with members of the front office staff, were on hand for the festivities. Not to mention White Rabbit, Cheshire Cat and their friends. Cavs in-arena hosts Ahmaad and Nicole emceed the shindig, and were joined on stage by Flashes of Hope founder, Allison Clarkeand more. As is the case every year, the highlight of the evening was the inspirational fashion show, which featured the full roster of Cavs players paired with pediatric cancer survivors and fighters. The Cavs and other Cleveland-area “Big Shots” accompanied their “Little Stars” for a heartwarming stroll down the runway. Everyone was dressed to the nines and visibly enjoyed themselves as they strutted their stuff for a good cause.